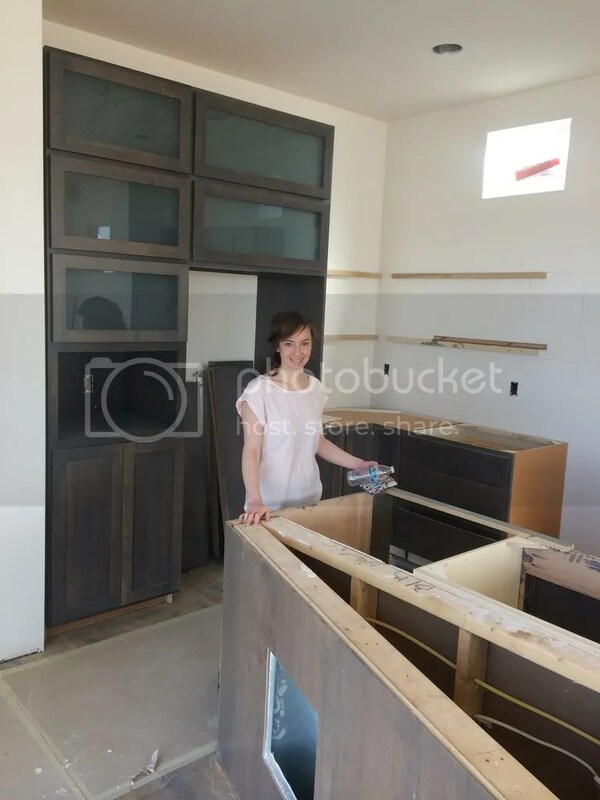 Ideally, I would have blogged this post as we were going through the journey of having a new home built, but I was too busy playing catch-up on the other posts that I never got around to this part. 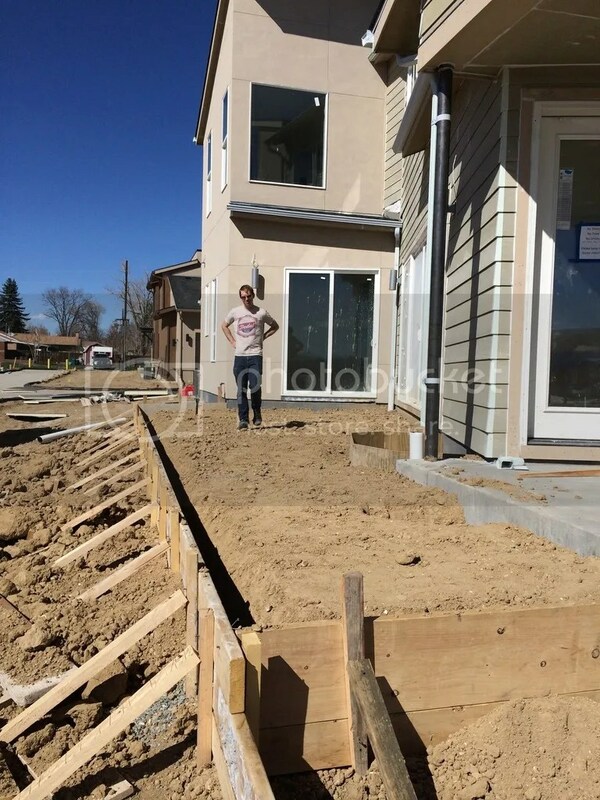 As it turns out, the process of building our home ended up being a rather long one, so it was much better that I am just now doing an overall recap of this process rather than trying to blog the process bit by bit. 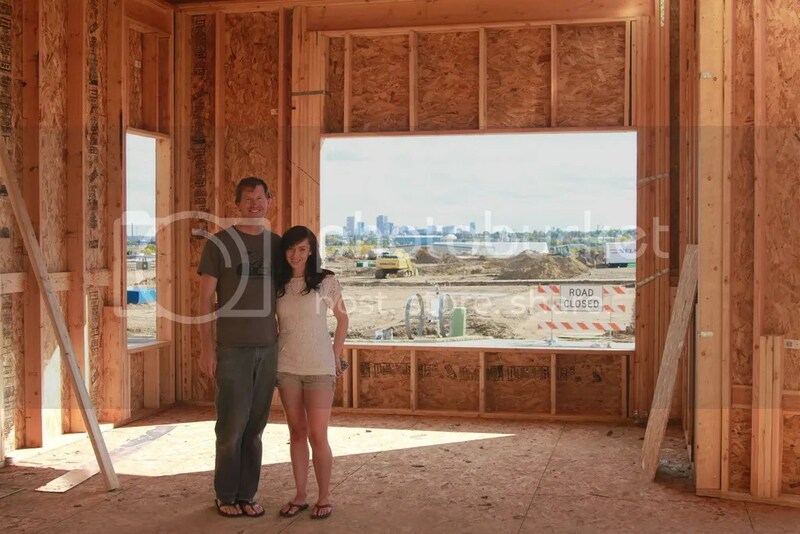 Just to refresh — Pie and I had begun our house hunting journey around December 2013. By January 21, 2014, we had officially decided that Midtown would be the location of our new, first home together in Denver. 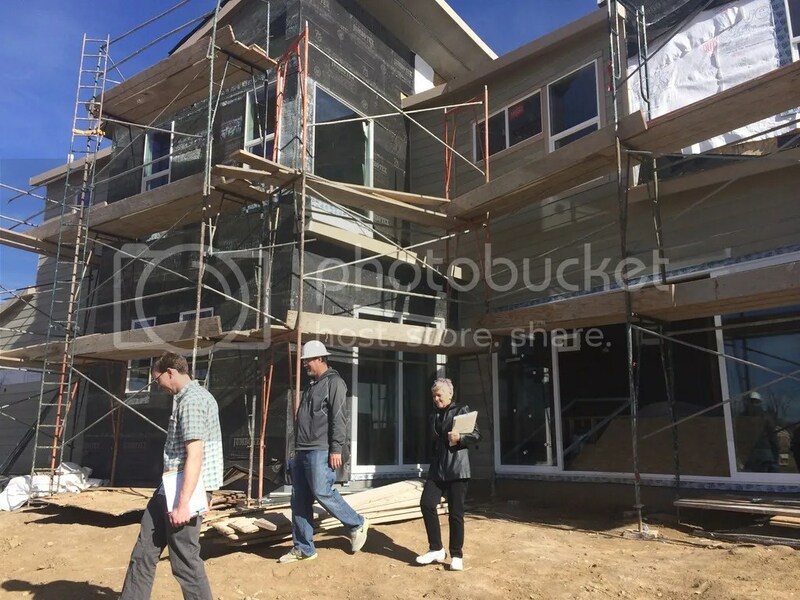 After signing our contract a few days later, the sales representative from the builder warned us that we would have be very patient during this building stage and that the homes on our block/phase wouldn’t be completed until near the end of the year, with October likely being the earliest. 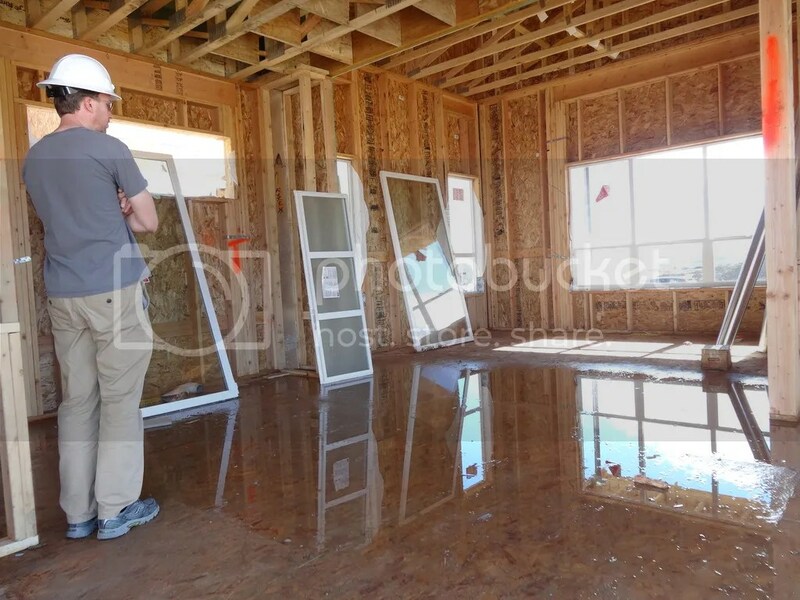 During our process of looking into new home builds, we had learned that, best case scenario, homes would take about six months to complete. 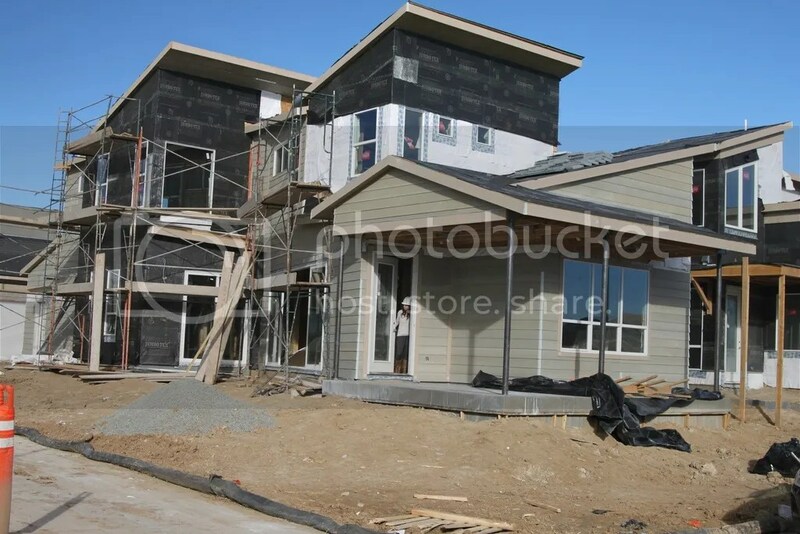 The small print in the builder’s contract that we signed also somewhat unofficially promised that our home should only take a year to complete once the building permit is pulled (our permit was pulled on March 31 and our closing date was on April 28). So the nine-month average that the sales representative was giving us was a reasonable prediction. Pie and I had already known going into the process that we would have a lot of waiting to do, so this was not new news for us. 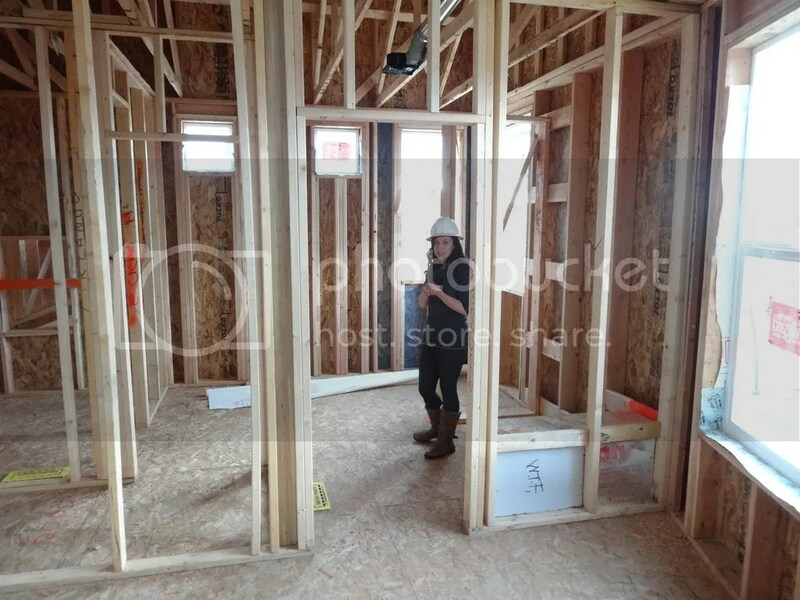 We were not necessarily in any hurry to get our new home and we figured we would just sit back and enjoy this special period of our life watching our first home be built together! It also didn’t hurt that we really didn’t mind living in our apartment in the meantime. The location of our apartment was superb! It was only 5 miles from downtown, close to a train stop, and in a great neighborhood! We wanted to relish that location for as long as we could because we knew our new home was located in a very “different” type of neighborhood. We ended up waiting much longer than we ever expected though — 1 year and 3 months to be exact. We are still uncertain as to what caused the big delay in getting our home built (there were no major delays due to weather), but we knew part of the reason we had to wait so long was because we had been the first to choose our house on that block/phase, and it just so happened that when they eventually began building homes in a sequence on our block, our house was at the very end of their building sequence (at the end of the block), and therefore, dead last to be completed. The universe definitely tested our patience during this process. While I think that Pie and I kept our cool during this long process, there were many points where it was really tough to visit our home and see no progress for several weeks and at the same time watch our neighbors down the street getting their homes completed much sooner than ours. We knew that complaining and throwing a fit was not going to get us our house any quicker, so we just continued to wait as patiently as possible and pouted to ourselves. The only snag in our wait-as-patiently-as-possible plan was handling our apartment lease and giving our 60-day move-out notice. 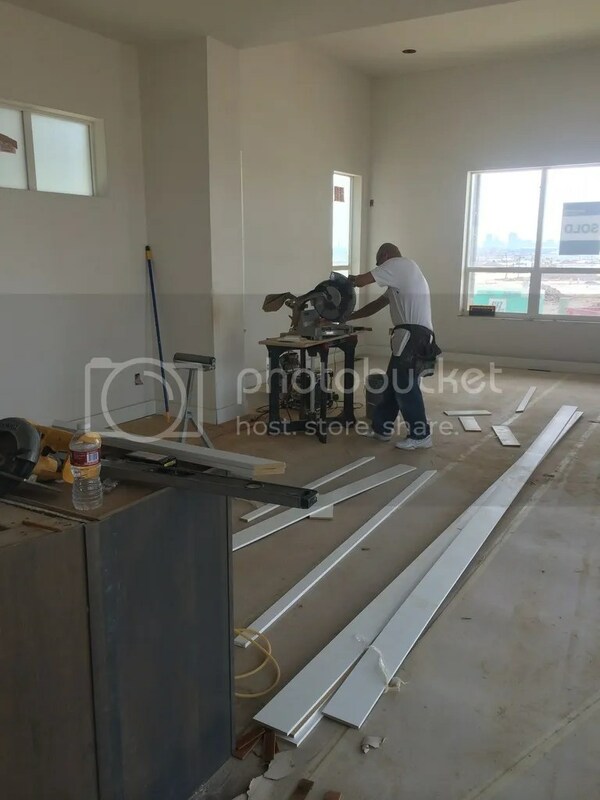 Although our apartments were mostly understanding of the ambiguous process we were going through, we knew we couldn’t keep them on the hook month after month each time the house was delayed. This was made more difficult by the fact that we got very few updates of when to expect our house to be completed after the continuous delays. We eventually blindly gave our final move-out notice for March 30th — thinking our house would surely be complete by then — but this date ended up being premature of when our house was ready. Fortunately, we were able to move all our stuff in storage and stay with relatives for a month while our house was completed. While having to move twice within a month’s time was not ideal, it was nice to finally sit back and relax while we waited for our home to be finished, instead of worrying about when to give our move-out notice with our apartments. 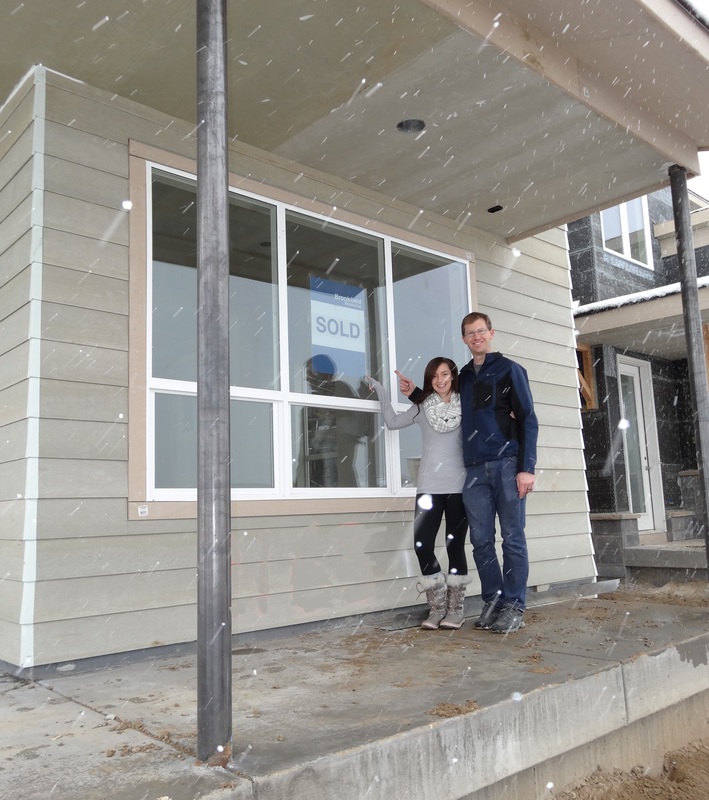 During the long process between purchasing our home and waiting for it to be built, we inevitably dealt with a lot of change-over in sales staff (three different sales managers to be exact). It was tough that we would really start to like working with a certain sales manager and then end up having to see them go, but besides a few minor snags trying to find our “custom” requests, all the sales staff were very pleasant to work with and they all seemed to try their best to be “on our side” during the delays and snags in the waiting game. 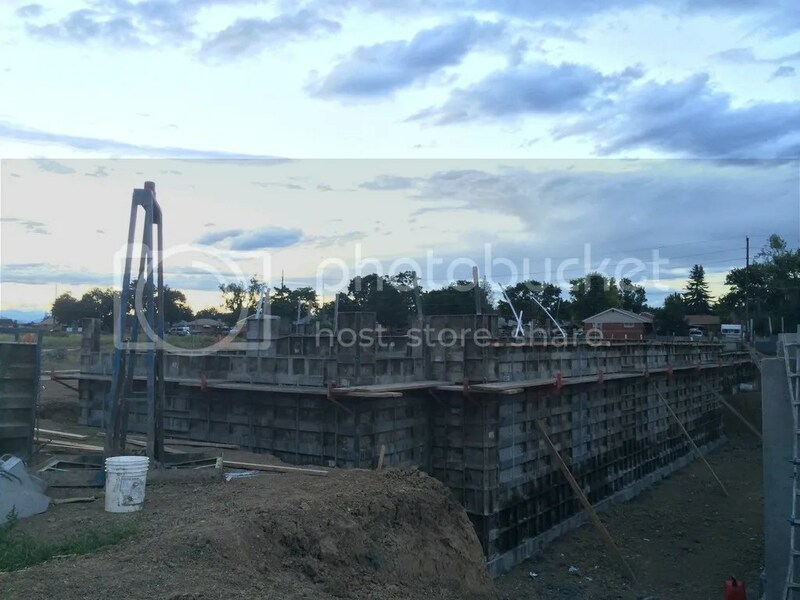 The long process of our home being built was an unusual circumstance though, so the timeline I will share of our house being built should be taken with a grain of salt for those going through the same process. 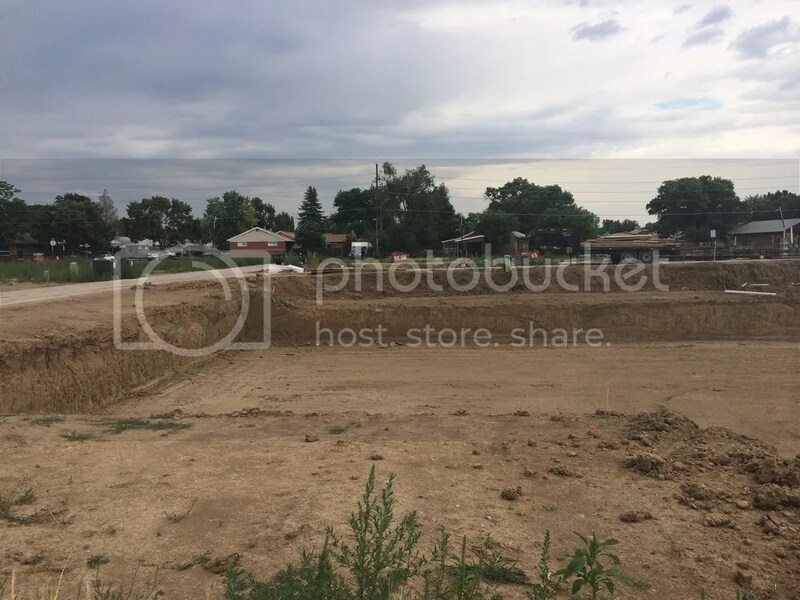 As you can see from this photo, digging for our home hadn’t even started, but homes right down the street on our block already had their basements poured. Pout pout! 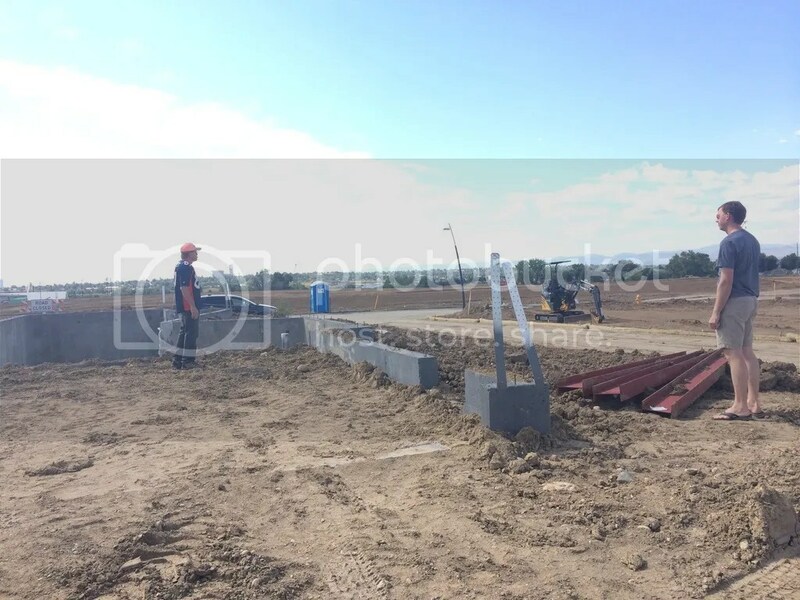 July 25, 2014 – Pre-construction meeting. 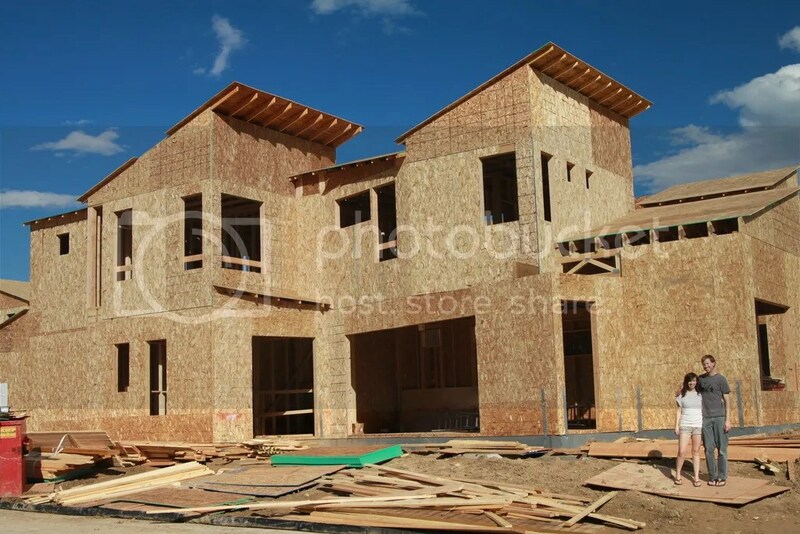 We are told to expect the house to be completed by November/December now, which seems very unreasonable to us. 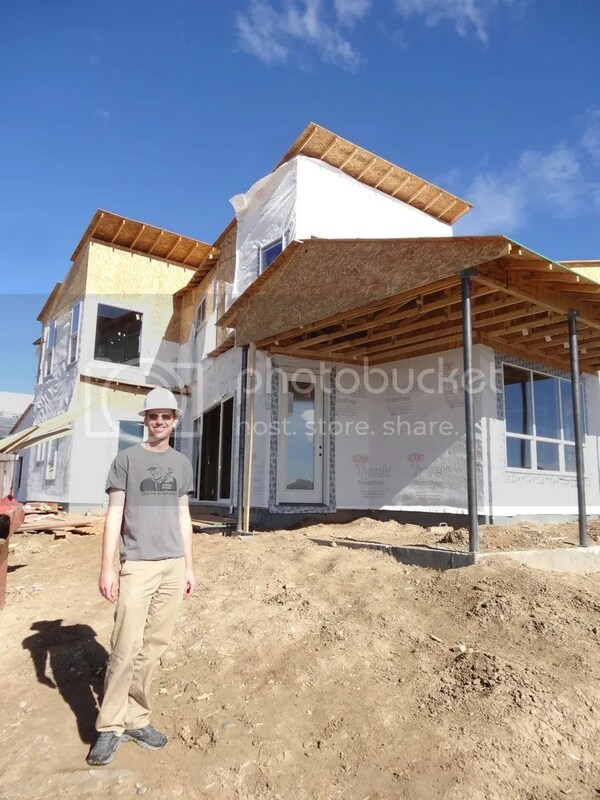 This gives them only 5 months to complete the house! For now, we have a great view of downtown. Swoon! 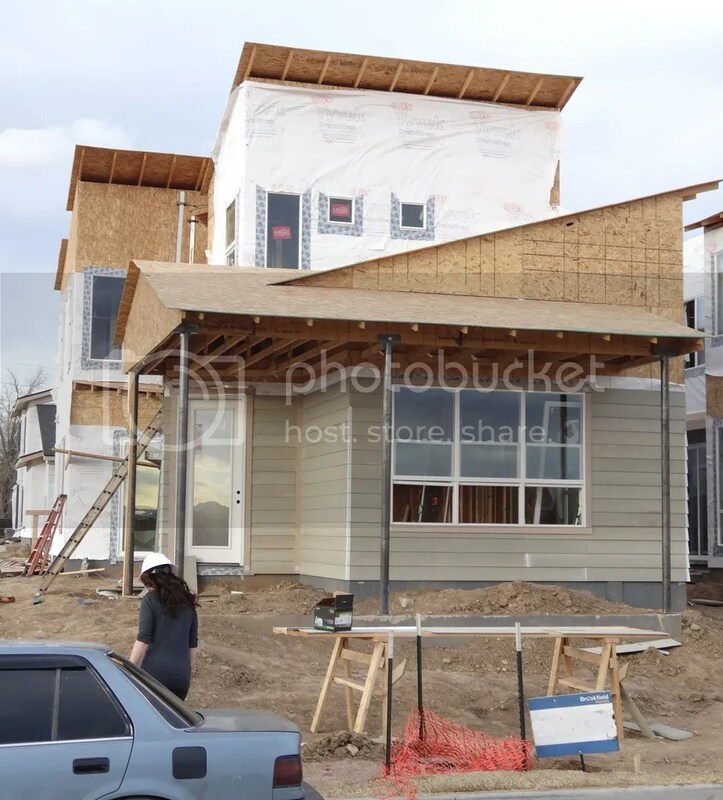 October 17, 2014 – We nag the builder about when to expect the house to be completed. Call us “crazy”, but it just doesn’t seem like it’s going to be done by November OR December. 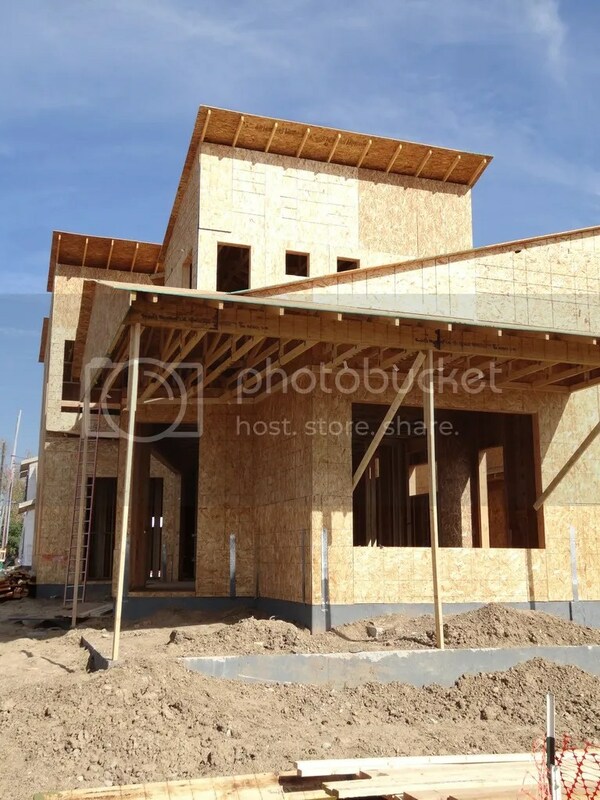 They very vaguely tell us that we should probably extend our apartment lease out till February 2015, just to be safe, but the house might be completed late January now. 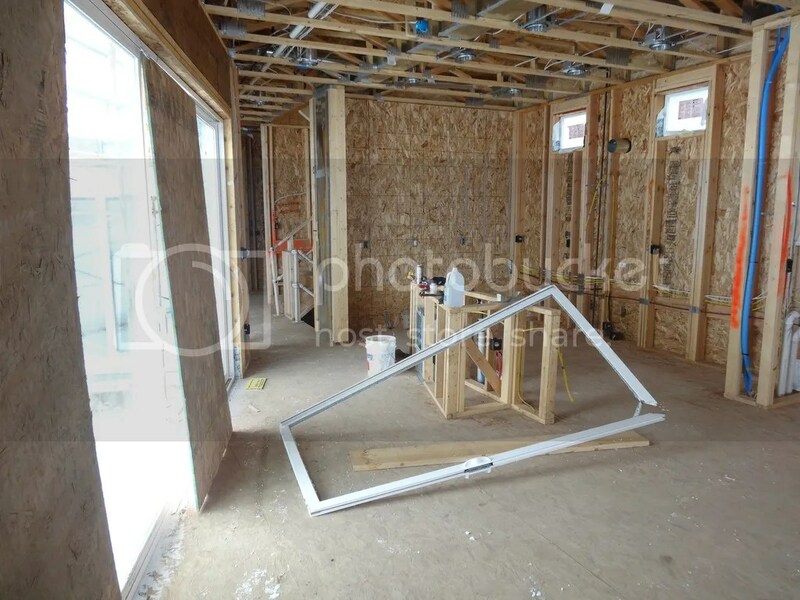 Some of our windows and doors were installed, but not all of them. And our roof was still not tiled, so lots of water got in our house. But this is to be expected. 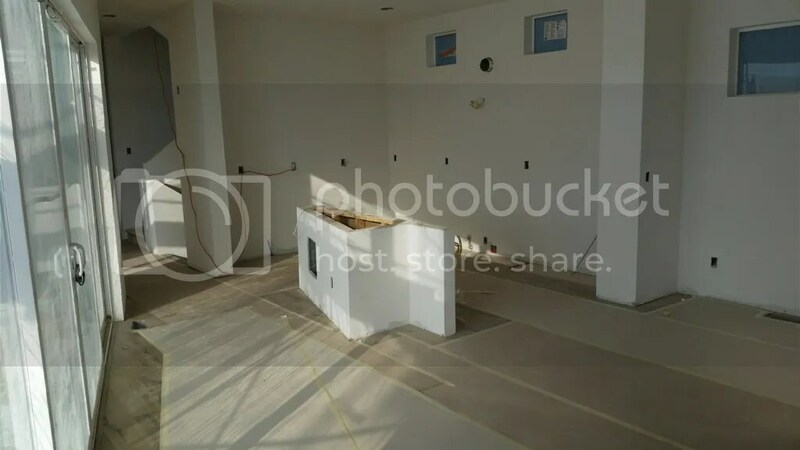 November 22, 2014 – We nag the builder again about a completion date and they are again vague but are still telling us that it kinda might be mid-February (instead of late January). I’m making a funny face here, but it’s just because it was always so darn cold when we were making these visits. And I always thought these would be quick looky loo’s (hence, no coat) but hubby would inevitably take forever geeking out over the insides of the home! 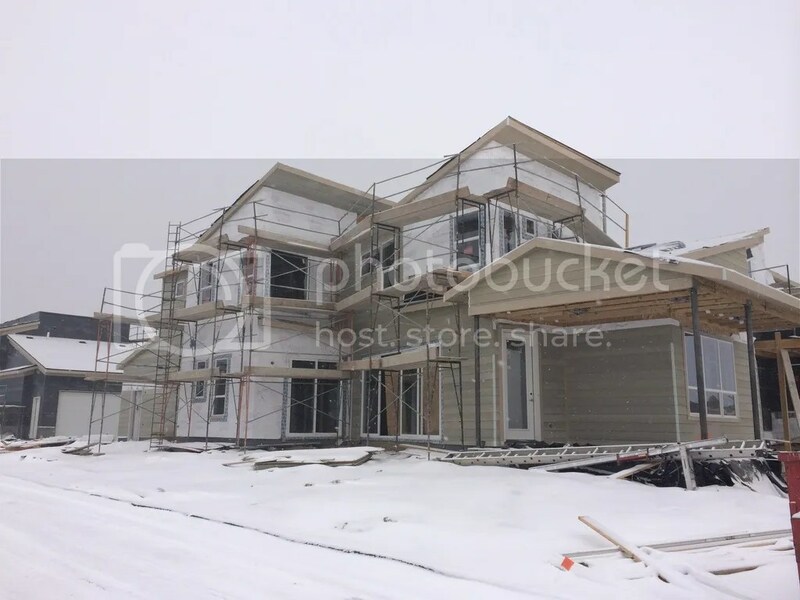 December 13, 2014 – We nag the builder again about a completion date and they are telling us end of March (instead of mid-February). 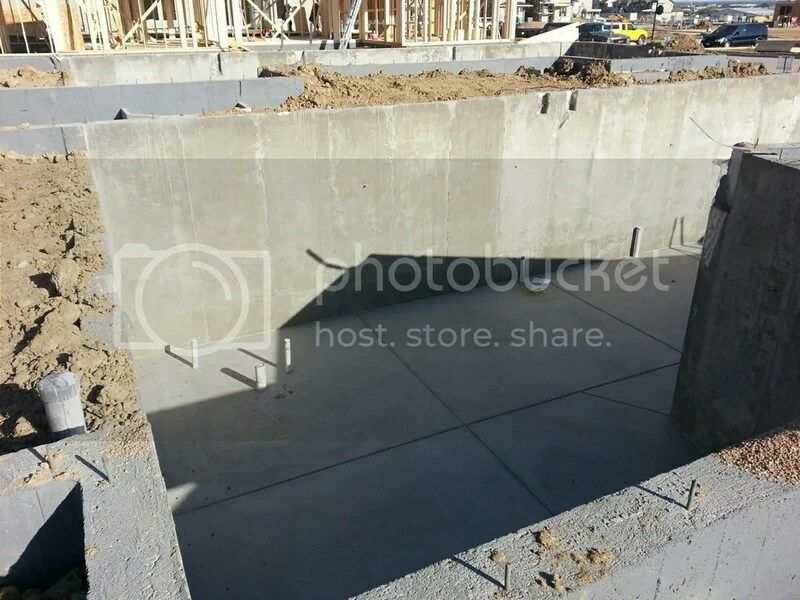 January 27, 2015 – Mechanical/Electrical/Plumping (MEP) Meeting/Walk-through. 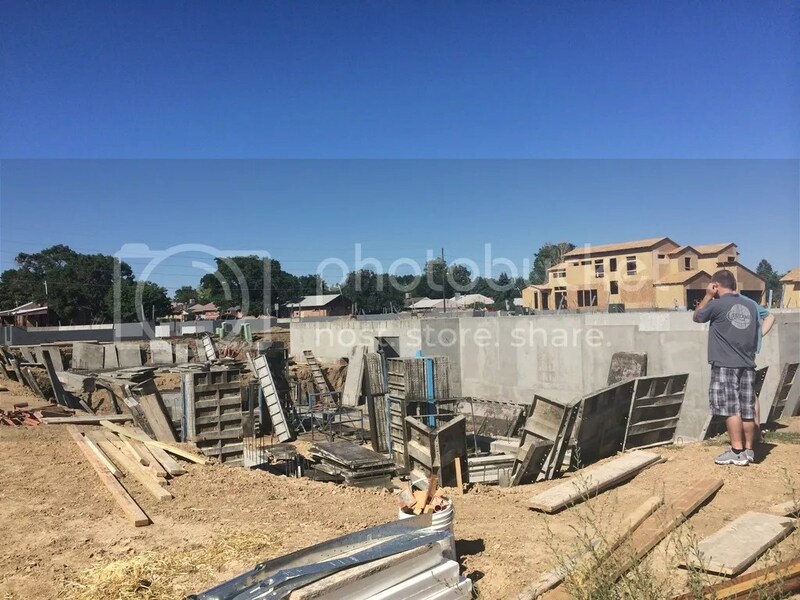 We had to nag the builder to make sure we did our MEP rough-in inspection before they started dry-walling. Ha! This should be standard, but they made it sound like requesting this walk-through was going to delay things. 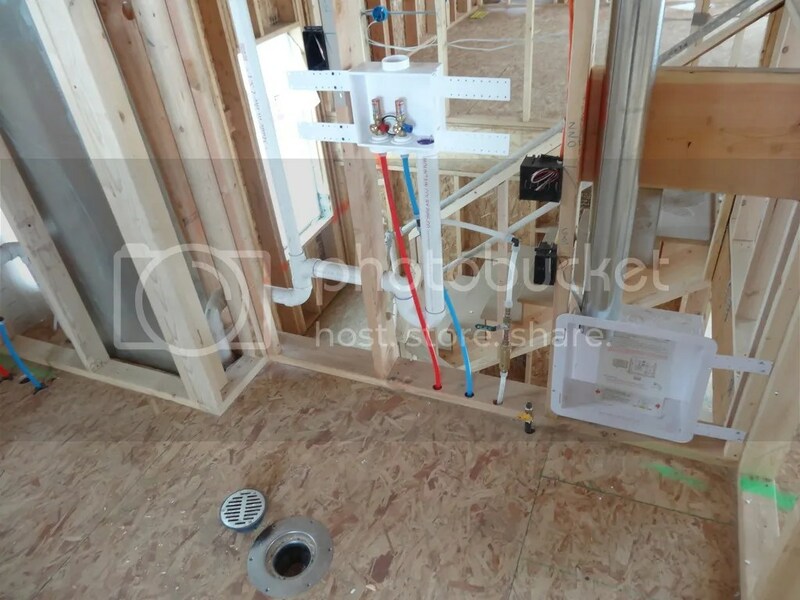 During the walk-through, we are again told that the house might be done mid- to late March…until we bring up an issue with some insulation that needs to be replaced; then, we are told if we insist on this fix, we are going to be delayed another two weeks. Of course, we insisted they fix the issue. 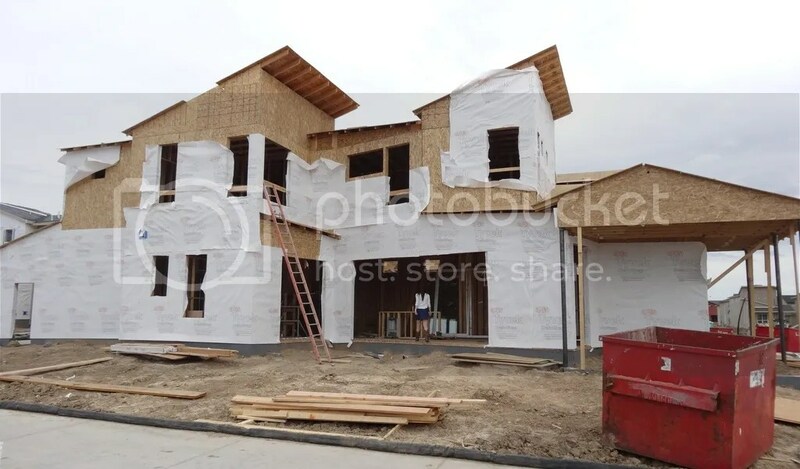 We had already waited this long for a house, what was a couple more weeks? At this point, we give our 60-day move-out notice to our apartments and cross our fingers! 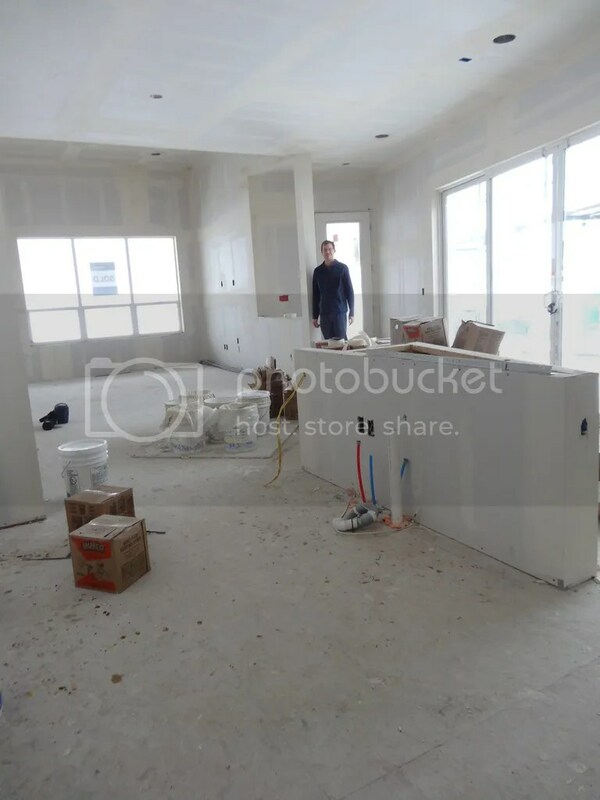 February 11, 2015 – Visit to Midtown: drywall almost complete and roof tiling on. 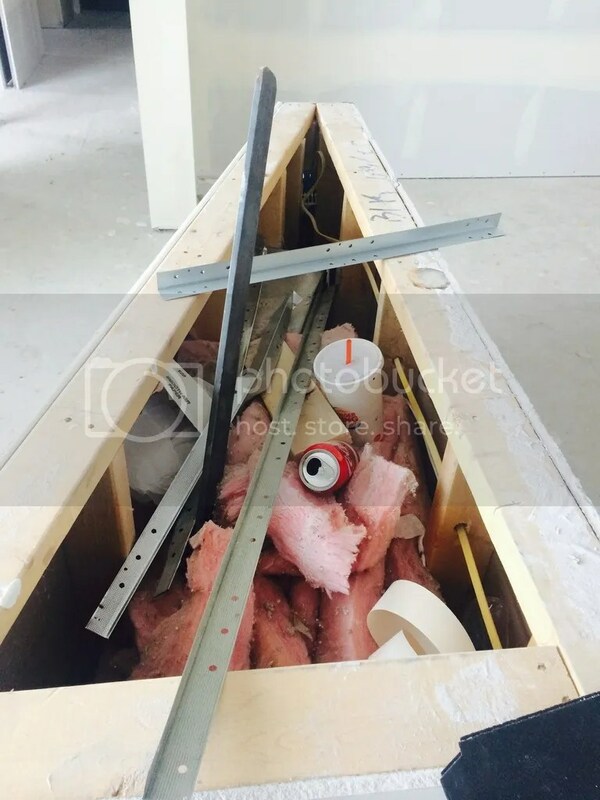 Yep, you read that correctly — they put in insulation AND drywalled before they finished our roof! And February is not exactly a dry month! This is NOT an ideal order of operations. 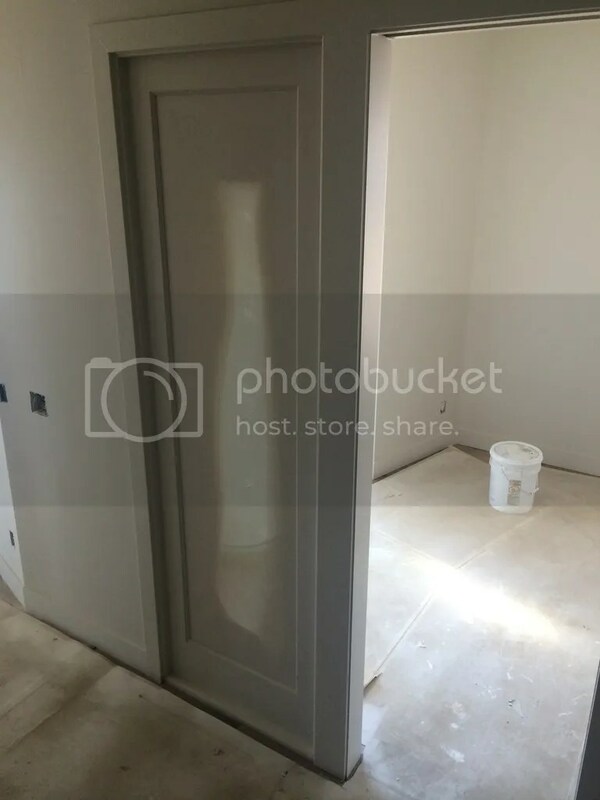 We tried to make sure this didn’t happen – garbage being closed up in the home from the construction workers (on purpose), but the drywalling of the house (of all things!) 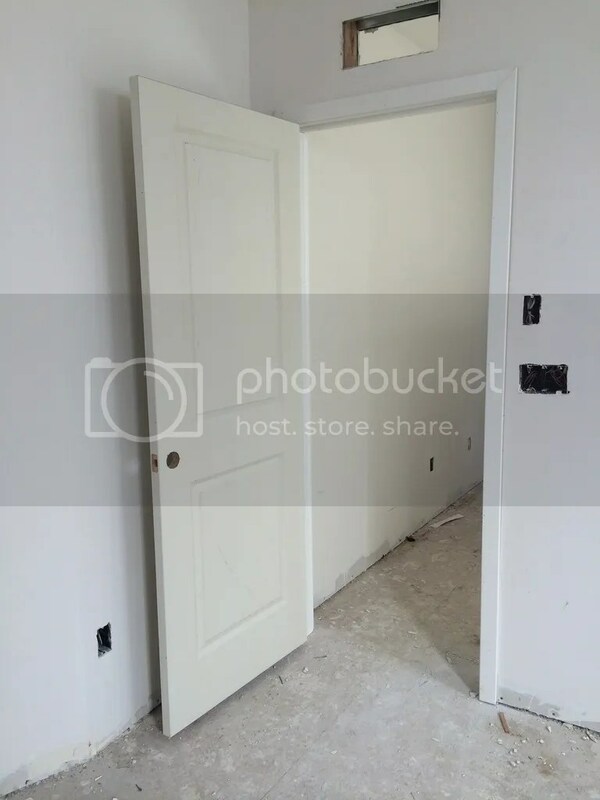 happened very quickly and we weren’t able to visit in the few days it took them to completely drywall. We did find this plethora of garbage in our kitchen island. 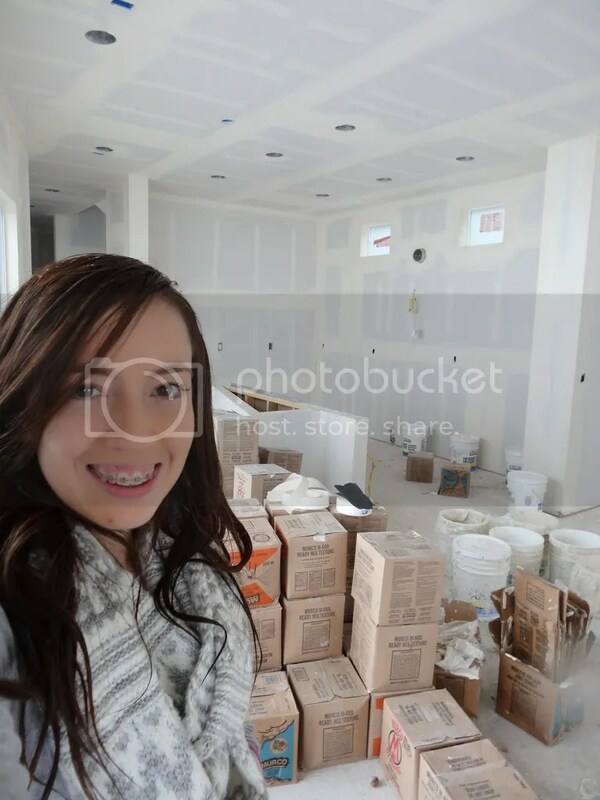 March 3, 2015 – Update from builder: drywall is complete so we should expect closing to be about 60 days out (late April); Hallelujah!!! …but where are we going to live for a month now that we told our apartments we were going to move out on March 30th??? This is actually a glass door to our study that got painted as well. I guess that’s how they do the painting. This glass door was eventually clean as a whistle! 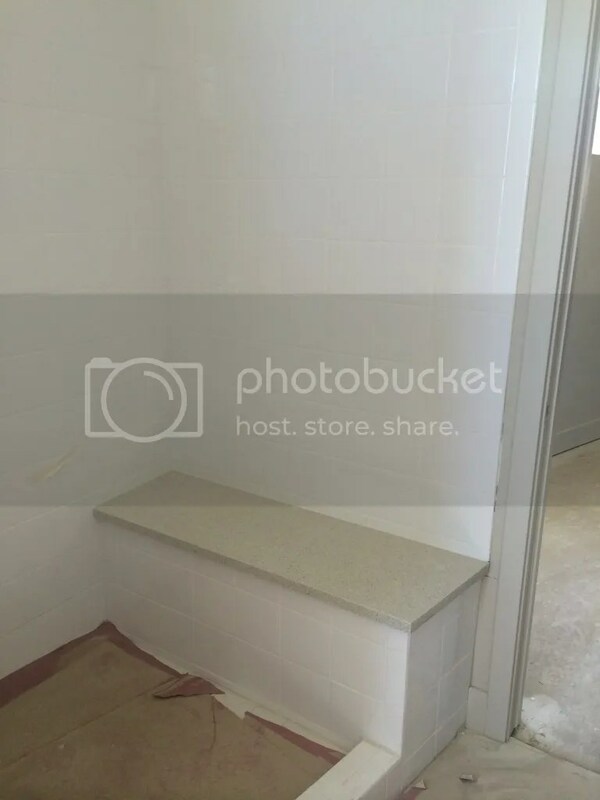 We used the same material for the master bathroom shower seat that we used in the kitchen because there was material “leftover”. 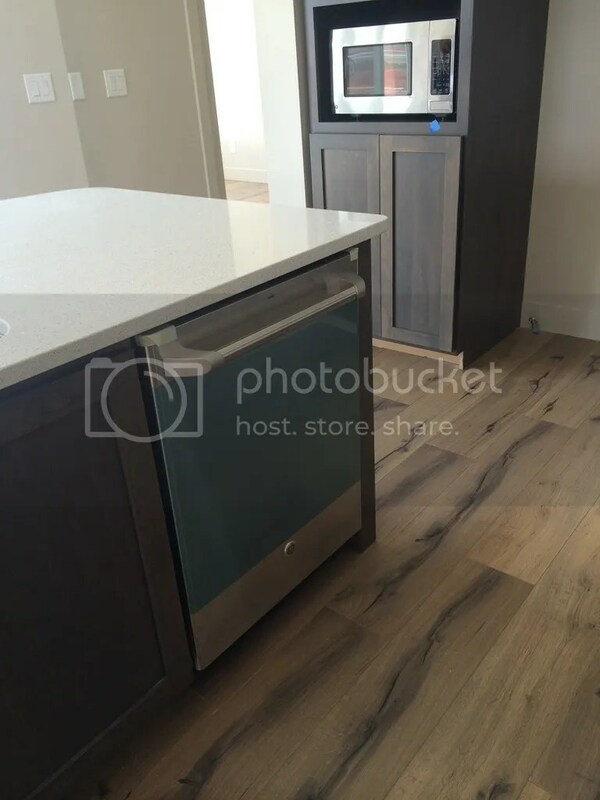 This was our first sneak peek of what our counter top material would look like and I panicked when I saw how gray it looked against the stark white bathroom tile. It ended up looking less gray in the kitchen. Whew! After we closed, there were still a few big things left to complete like the front yard landscaping and our fence, but there was almost nothing with the house itself that wasn’t ready to go. As a matter of fact, two weeks before closing, the place looked so great (except for minor dings) that we wished we could just move in already! 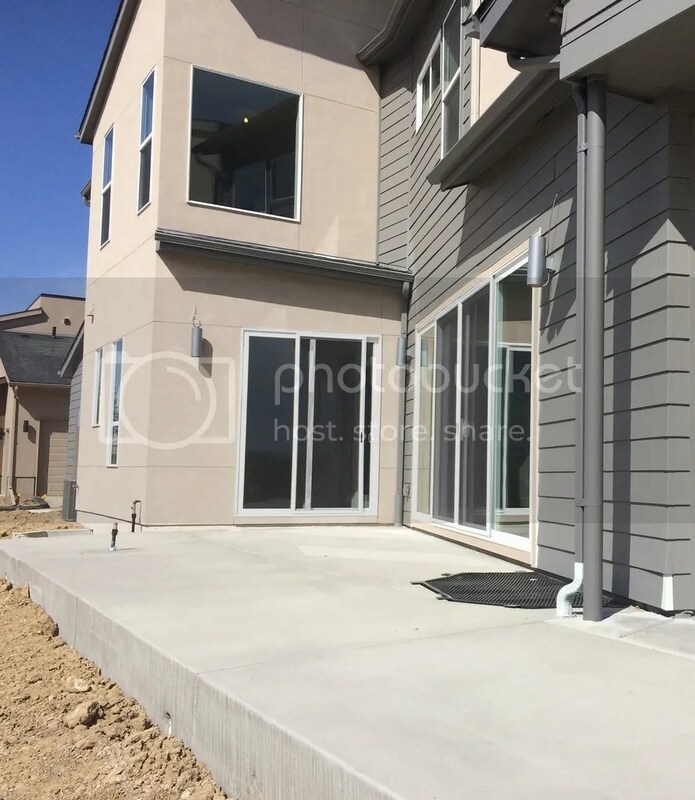 This was much different than what we had heard from other Midtowners, who said their house did not look complete at all, despite closing day being right around the corner! I guess our house took so long that they had no excuse not having everything ready! 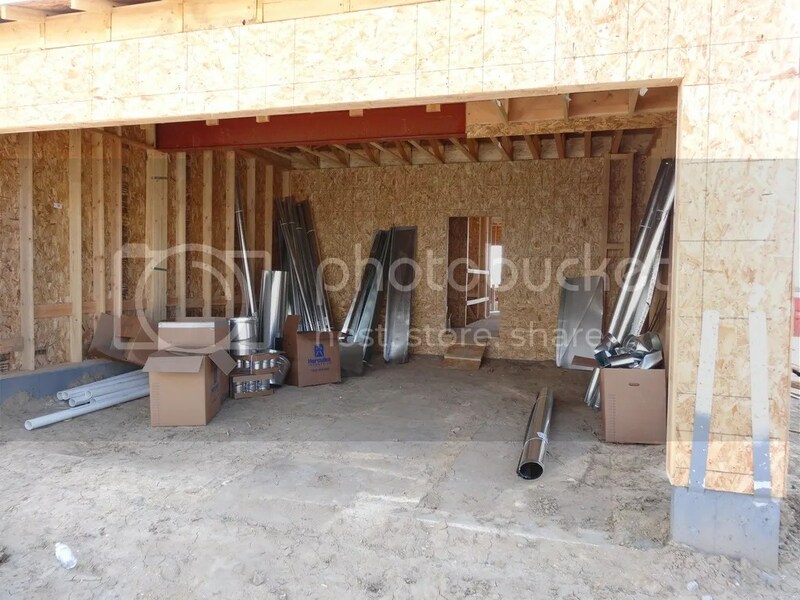 In fact, they even went an extra mile and dry walled our garage! We certainly weren’t complaining! Although we had a long wait, we definitely preferred for everything to be done slowly and done right the first time. That’s so great to hear that this is helpful. Good luck! People will tell you the time “flies by” and you’ll be moved in before you know it, but it doesn’t! But you can still make the most of this time waiting!